Flores is the westernmost island of the Azores Archipelago, part of the archipelago’s western group. The island technically lies on the North American continental plate, and the village of Fajã Grande in Flores is actually Europe’s westernmost village. 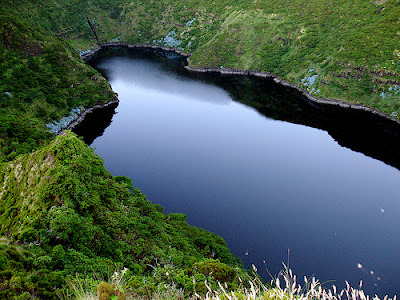 Flores is considered one of the most beautiful of the Azorean islands. The word “Flores” in Portuguese means flowers – fitting since Flores is a pretty collage of blue and pink hydrangeas, amid deep valleys, high peaks, volcanic caldeiras, fresh water lakes and waterfalls, sulphurous hot springs, pastures and vineyards, exotic forests, and cliffs carved with grottoes. Once a kept secret, Flores has seen its tourism industry grow substantially in the last decade. 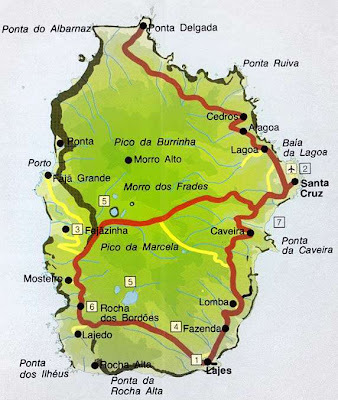 Flores was first discovered in 1452 by Diogo de Teive and his son. It was named Flores for the copious wild flowers covering the entire island. 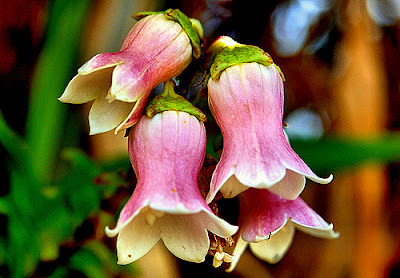 It is believed the seeds of the island’s flowers were planted by migratory birds from Florida. The town was initially settled by a Fleming, Wilhelm van der Haagen, followed by farmers from the Portuguese mainland who turned the island into an agricultural producer of barley, wheat, maize and woad. For centuries, Flores was isolated, visited only by the odd cargo trading boats, pirates, and enemy fleets like that of the English in 1587. Pirates were especially attracted to Flores; during the 16th and 17th centuries, the island served as a refueling base for Spanish galleons returning from Mexico and Peru with valuable treasures, which drew the attention of pillaging bandits. During much of the 18th and 19th centuries, Flores was frequented by U.S. whaling ships. The French established a satellite communications center in Flores in 1963 and remained on the island until 1994. In recent years, improved port facilities and the construction of an airport have helped the island develop economically, especially in the agricultural and livestock-breeding industry. Flores is said to offer all of the natural beauty found in the other Azorean islands in a single island. The typography of Flores is rugged with several cliffs that descend into valleys and lakes. One of the most popular attractions is the seven lakes of Flores located in the central part of the island. These craters were once volcanoes but now form seven beautiful lakes. The Rocha dos Bordões is a spectacular scenic site offering views over the Fajã Grande and the Ribeira Grande waterfall, which drops from a 1000 feet altitude, as well as views of the other 20 waterfalls at Fajazinha. From below, the Rocha dos Bordões presents a majestic picture of vertically-indented lines of basalt formations. The Morro Alto, which is the highest point on Flores at an altitude of 3000 feet as well as the Sete Pés Pico, the Pedrinha, Pico da Sé are all mountain peaks worth visiting. Aside from the scenic views, there are many natural lakes along the climb up the slopes of these mountains that can be enjoyed. The caverns and hot springs of Flores are worth visiting as well. The Gruta de Enxaréus (or Gruta dos Incharéus) is an enormous cavern by the seashore, measuring 165 feet long and 80 feet wide. And Ãguas Quentes is the site of small hot springs that boil with sulphurous waters. Flores has a vibrant festival life, holding many traditional celebrations involving folk dance and music like the Sapateia, the Tirana, the Remo, the Chamarrita Encaracolada, the Manjericão, the Pezinho de Baixo, the Ciranda and many others. The Santa Cruz festival is a particular favorite. Held in August, the entire village of Santa Cruz is decorated and covered with flowers. Other festivals include the Holy Ghost Festival, the Sanjoaninas Festival, the Lady of Flores Festival, the Folares Festival in Easter, and the Emigrant Festival in June. Flores offers unique specialty dishes like the Agrião Soup, molho de dobrada, terra root with linguiça, pork cozido, beans with pig's head and seaweed pastes. Flores cuisine is also particularly noted for its use of honey taken from the island’s beautiful flowers. The local seafood – crabs, limpits, and cracas – is raved by many tourists. The island also produces some of the most delicious cheeses, noted for their creamy and soft buttery textures.